Can Group-Housed Sows be Raised at Lower Temperatures to Reduce Barn Heating Costs? Operant mechanisms allow sows housed in group systems to control their own environmental temperatures, allowing for lower barn temperatures, according to B. Predicala, A. Alvarado, D. Beaulieu and J. Brown of the Prairie Swine Centre (PSC) in Canada in the Centre's Annual Report for 2013-14. In this project, an operant mechanism that will allow sows housed in a group system to control their own environmental temperature was developed. The mechanism was configured with a manual control switch that the sows can access and operate, which in turn activated the supplementary room heating system, as well as a localised radiant heater above the location of the switch as an immediate reward. Testing of a prototype system installed in a controlled-environment chamber with two sows showed that the mechanism functioned satisfactorily to allow the sows to control their environmental temperature. 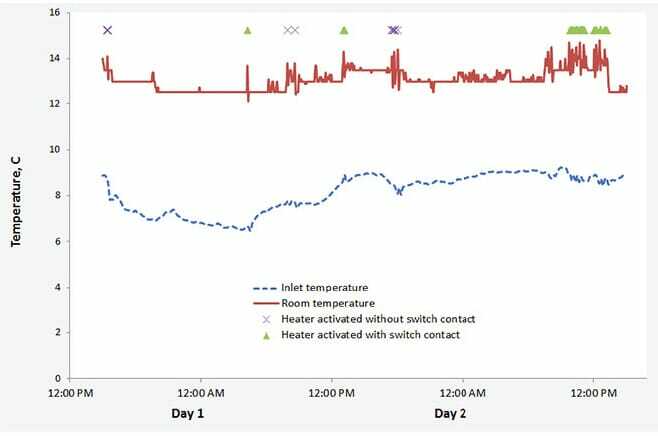 Preparations for subsequent tests in group-housed sow gestation rooms to assess overall heating cost savings, associated sow behavior, and optimal dietary requirements when raised at lower temperatures are underway. It was hypothesised that sows housed in groups can be maintained at lower environmental temperature because the sows have the opportunity to exhibit thermoregulatory behavior such as huddling when the barn temperature is lowered, thereby saving on energy to heat the barn. The objective of this project was to develop a mechanism that will allow group-housed sows to operate the heating system in their airspace and maintain the environment at their preferred temperature. An operant mechanism comprised of a manual control switch that operated the existing supplementary heating system for the sow room as well as a small radiant heater placed above the area of the switch as an immediate feedback reward was developed. The underlying principle for this operant mechanism has been successfully implemented in a study to assess the temperature preference of nursery pigs (Bench and Gonyou 2007). The initial design of the operant mechanism shown in Figure 1 was composed of three timers and an isolation relay. Timer 1 was used to supply power to and activate the isolation relay while timers 2 and 3 were used to activate the heat lamp and the room heater, respectively, over the time period set for the timer. Also, timer 1 was used to deactivate the push button over the time period set for the timer, to prevent extended operation of the system in case the button was activated in close succession. A prototype module was assembled and installed in a controlled-environment chamber at the PSC barn. Over a two-week period, the environmental temperature in the chamber was monitored continuously using data loggers, and the sows were observed by video camera for 24 hours to assess the learning process of the sows to operate the mechanism over time, the average temperature selected by the sows, as well as operational parameters to optimise the settings of the operant mechanism. Data gathered over the two-week testing period of the operant mechanism and the associated controls, switches and heaters showed the temperature in the room and in the inlet zone as well as the instances that the button was pressed to activate the room heating system over this 48-hour period (see Figure 2). The air coming into the chamber through the inlet had an average temperature of 8.1°C and ranged from 6.5°C to 9.2°C over this period. On the other hand, the temperature inside the room was about 13.1°C on average and ranged from 11.5°C to 16.0°C. The difference in temperature between the inlet and the room can be attributed mostly to the heat generated by the sows and the supplemental heat from the heaters when in operation. Validated data showed that the room temperature selected by sows ranged from 13°C to 14°C, with most hits on the switch occurring when room temperature was about 13.5°C. This temperature occurred during daytime when sows were mostly awake and active. At night, sows seemed to tolerate room temperatures as low as 11.5°C while asleep. In addition, there were instances that the temperature in the room was below 13°C during the day and sows did not even bother to press the heat control switch. Figure 2. Measured temperature in the animal-occupied zone in the controlled-environment chamber and in the inlet zone as well as the occurrences of activation of the heating system in the room over a 48-hour period. 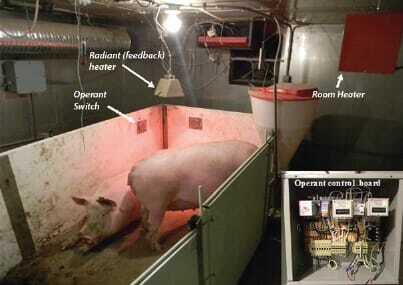 From this work, it was shown that an operant mechanism with an accessible control switch and associated functions to allow sows to control their environmental temperature can be successfully developed. Subsequent barn-scale studies using the developed operant mechanism to determine energy savings from allowing group-housed sows to control their own environmental temperature, impacts on general activity, body condition and weight gain of sows, and addition of high-fibre in sow diets to supplement sow metabolic heat generation, will be among the next steps. the Saskatchewan Pork Development Board, Alberta Pork, Manitoba Pork Council, Ontario Pork, and the Saskatchewan Ministry of Agriculture is also acknowledged by the authors.